Mexico offers some great opportunities for whale watching. More than 20 species of cetaceans spend time around Baja California. Star of the show goes to the Grey whales which make a migration to the Sea of Cortez every Autumn from the northern Bering waters to give birth to their young and spend the winter in the warm waters near the equator. 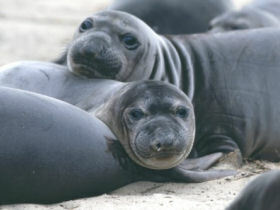 This is the longest migration of any mammal, traveling 6,000 miles at a steady speed of about 4 knots. More than 20 species of cetaceans spend time around Baja. Grays breed and calve in the lagoons along the Pacific. 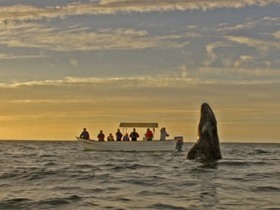 Bahia Magdalena is a center for gray whale observation. Humpbacks and blues breed in the Sea of Cortez; Bahia de los Angeles is the center there. If you’re the kind of person who prefers to remain on shore, the Cabo San Lucas at the peninsula’s southern tip is a good spot to observe passing whales and have your feet firmly planted on the ground. Mexico whale watching will reveal colonies of grey whales that are among the most gentle whale species in the world. Grey whale mothers are incredibly protective and make especially attentive caretakers. Tourists are likely to see mothers at play with their calves, and can be seen carrying their calves on their back when the young become tired.